Who here is a scarf fanatic? Well my best friend and I definitely are and we were looking for a cute way to store our scarves! 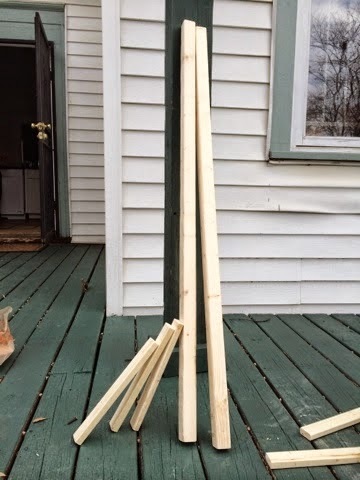 After looking at Pinterest, we decided to build ourselves some scarf ladders! This was actually a relatively cheap project ($13 each) and took us about 2 hours to complete (including the trip to Home Depot). – In Home Depot, get a long (8ft), thin piece of wood and ask the employee to cut it in half. 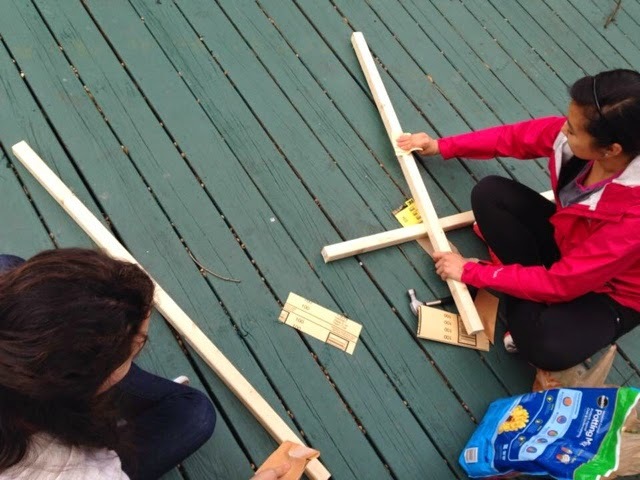 – Grab another long piece of wood and ask him/her to cut it into 3 pieces that are each 1ft long. – Pick your paint color! 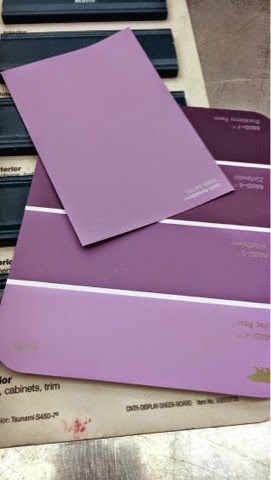 My friend and I chose Glidden’s Soft Amethyst. Here’s how to build the ladders! 1) Sand all parts of the wood down so that you don’t get any splinters! 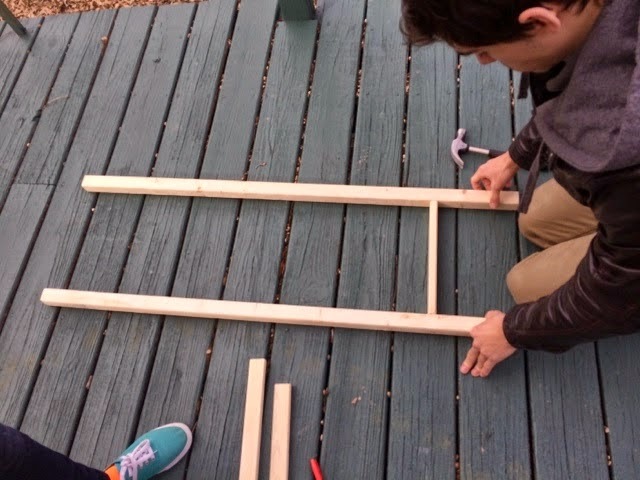 2) Layout the wood out the way you want to assemble it. 3) Hammer a nail through the side of the long piece of wood into the smaller piece of wood. I was really bad at this part so my best friend’s boyfriend helped us with it. 4) After the ladder is assembled, it’s time to paint it! I did this over leaves so that I didn’t stain any paved part of my friends’ backyard. Do two coats if you can and don’t forget to paint the bottom parts of the rungs! 5) Let it dry overnight! And you are finished! 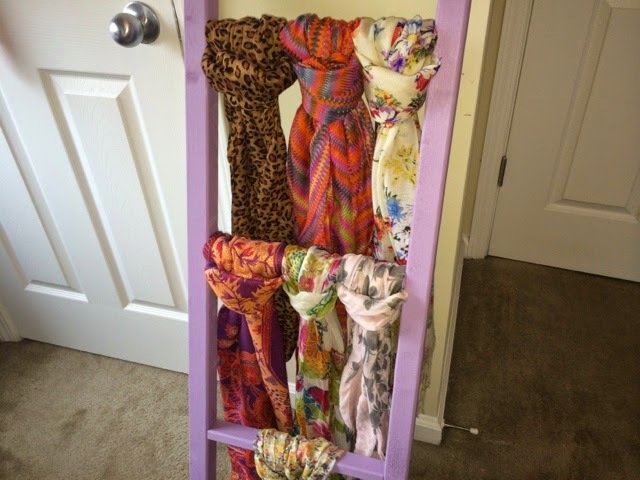 When you bring your ladder to your room, it’s time to put scarves on it! All you need to do is loop the scarf over the top of the rung and then pull the rest through the loop. 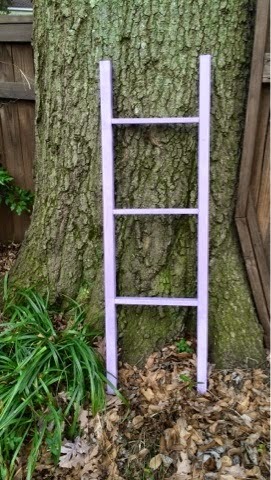 I tried to put contrasting colors next to each other to make my ladder look interesting. I only had 7 scarves to put on mine but my best friend fit 12 on hers! I hope you all enjoyed this post! 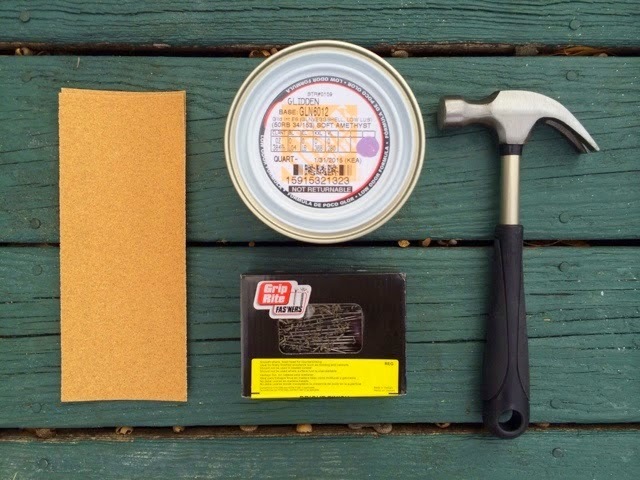 This is a fun, inexpensive project to do with your friends. I can’t wait to do more DIY projects soon!